Karyn Buxman, RN, MSN, CSP, CPAE, CHP is an international speaker, successful author, and neurohumorist (she lives at the intersection of humor and the brain). 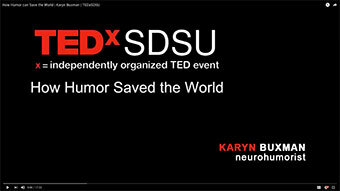 Karyn is a pioneer in the field of applied humor, starting with her Master’s thesis in graduate school and now continues her partnerships with leading neuroscientists. Today, Karyn helps leaders—and those they serve—achieve peak performance and optimum health through the art and science of applied humor. More than 500 organizations—including NASA, the Mayo Clinic and the Million Dollar Round Table have hired Karyn to entertain, educate, and inspire their audiences again and again. She is one of 227 people in the world—and one of only 39 women—to be inducted into the National Speaker’s Association’s Speaker Hall of Fame. To improve global health, business, and peace through laughter and heal the humor-impaired.